Using Microsoft Disk Operating system or MS-DOS, the internal command erases files from a disk. You can erase a single file or even a group of files in a directory or folder of a storage, like the USB flash drive. The file- name is the name of the files to be erased. You can use wild card characters in your command, like star dot star or asterisk dot, asterisk (*. *) to erase a group of files. Erase is another name for delete. If you use the /p parameter of your command, the command line will ask you first or confirm before to go on deleting a file. And if you include the INV*. * in your command it will erase all files that begin with "INV" in your disk. Open your computer, once you in desktop, click start menu then click in search bar and type cmd, then enter key. Or find the program called "command prompt". 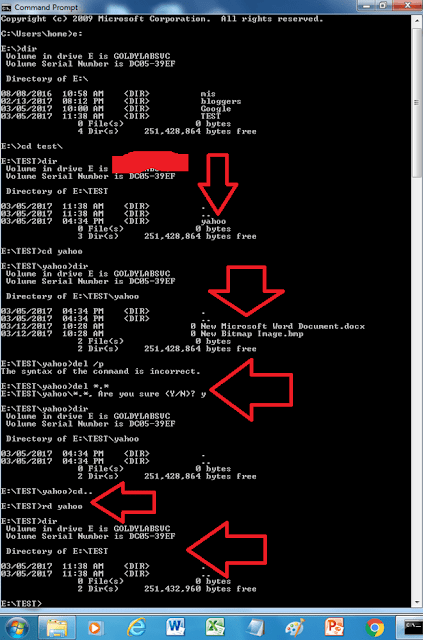 If your command line like this, e:\> find the folder with multiple files you want to erase using this command, ex. e:\>cd test, then enter key. Because in my image above the files is the main directory of test. The entire is like this: e:\test\yahoo>DEL *. * , using this command all the files inside the yahoo folder will be deleted. See the image above. 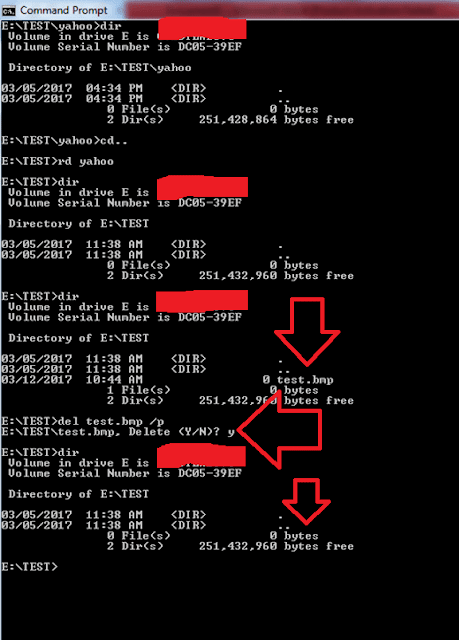 In my example, the file is inside of the directory of test, so I open the directory of test using the cd command. Once your command line like this: e:\TEST> type the command DIR then enter to display the files inside of the directory. Once it will display, type the command like this: DEL test.bmp /p, in my example, my filename is test.bmp, then I'm using /p parameter in my command to confirm first before to erase the files. INV file is a file extension came from the files commonly use in a games. This is a data files not a document files in your office applications. Open first the drive where the directory of files is stored. Use the command we mention before in my last post. See the first image above of this post. Then to confirm directory deletion, type DIR command to display. Take note this command is a dangerous for your computer. This possible to erase important files in your computer. So you must be careful and check before to erase a file.